My inspiration for this post came from my mum, a lifelong jam lover. Growing up I remember her enjoying lashings of jam spread on toast at least once a day. In hindsight it was far from nutritious but 25 years ago little did we know about added sugar…. A huge amount of sugar is typically added to store bought jam. Take for example the brand of raspberry jam I grew up with – the top three ingredients are Raspberries, Glucose-Fructose Syrup, Sugar. The product contains 50.4g of sugar per 100g (less than 5g of which comes from the natural sugars in the raspberries!) – that’s a whopping 7.6g per 15g tablespoon. Thankfully after much earache from me I’m pleased to report that today my mum chooses butter over jam – but I’m sure she still reminisces about the good old jam days. Which brings me to this post. My mum travels from the UK to Sydney in a few days and I’m keen to surprise her with some saintly homemade jam. 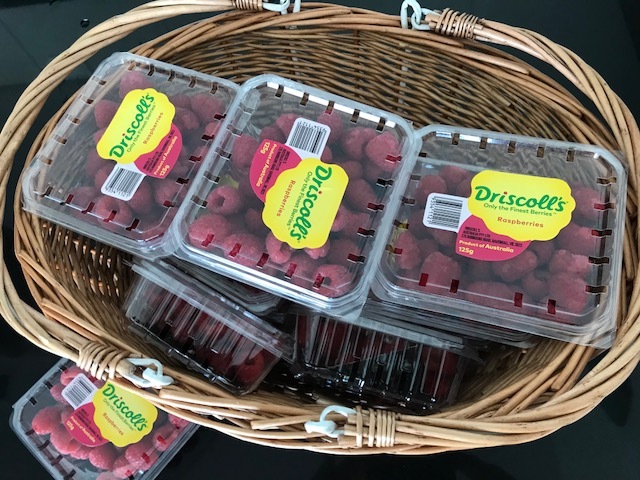 I picked up a whole tray of raspberries from Harris Farm Markets for just $1 per punnet (an irresistible bargain considering they are usually $5 per punnet). Within a couple of hours they’d been turned into this fibre packed, no added sugar jam. Whether you make this recipe with raspberries or strawberries a tablespoon serving contains less than 1g of natural sugar from the fruit. The other big benefit is that it’s packed with fibre thanks to chia seeds and psyllium husk. Both of these ingredients also help create a jam like texture. 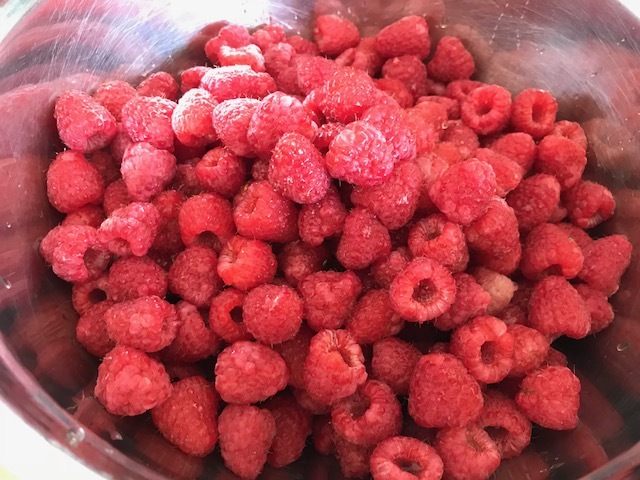 Clean the raspberries carefully as they are easy to damage (I added them into a colander and gently ran through water). Add the berries to a bowl with the lemon and, using a blender, roughly blitz them into a smooth consistency. Pour into a pan, adding the (optional) honey, and bring to the boil before reducing the heat as low as possible. Add the chia seeds and psyllium husk and simmer gently for a 3-4 minutes, stirring well throughout. Turn off the heat and stir through the (optional) vanilla essence. Leave to cool and then transfer to sterilised glass jars. Store in the fridge and use over the next month. 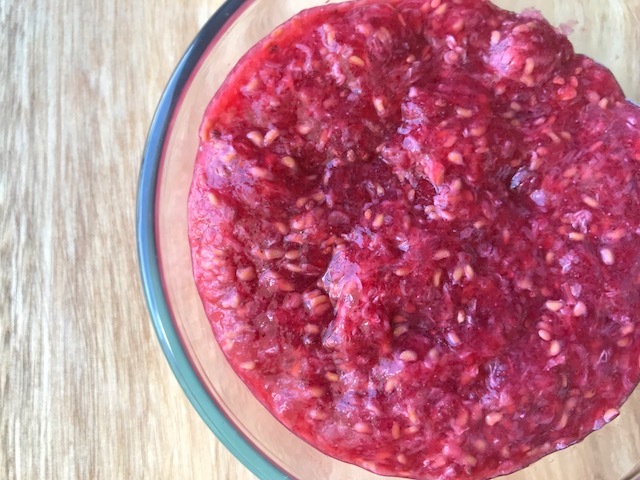 I love this recipe because it’s so simple – even for a jam novice like me. And shout if you have any jam making tips as I’m sure that my next batch won’t be too far away! Tags: chia seeds, jam, no sugar, raspberry. Bookmark the permalink. Hi Annika – yes do show him it and highlight the amount of sugar in a typical supermarket product….and yes try this recipe, it’s so simple! What a good daughter you are, Laura. Psyllium husks, Chia seeds. I see I will have to visit my local health food shop. Sounds worth it. 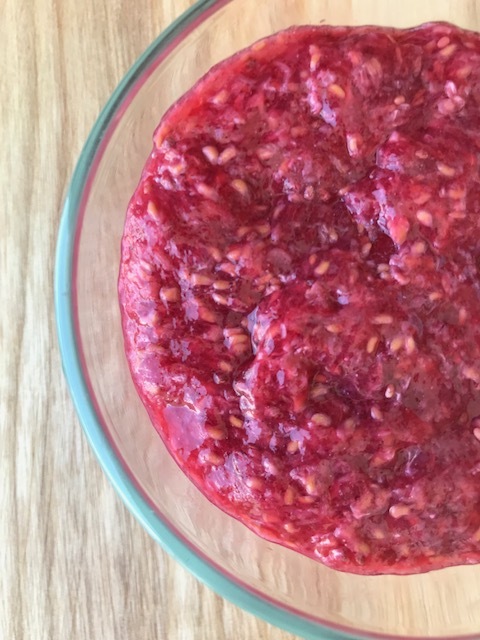 Maria – so glad you’re a jam fan and like this recipe – and of course it could easily be made sweeter with stevia or honey….do share any tips if you give it a go! Thanks Kay – in that case you’ll love this recipe…. Laura I love how healthy home made jams can be and taht we can actually taste the fruit in it, not just sugar or corn syrup. I have made strawberry ones with chia but adding psyllium fiber is a great idea. More fiber too! 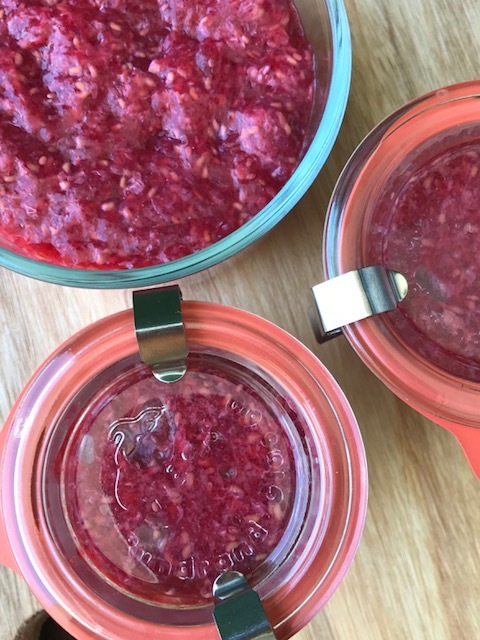 Thanks Sandhya – I didn’t realise that the chia jams were becoming so popular until I wrote this post – I’ll have to try strawberry next time. This looks awesome ! It is a wonderful feeling to use home-made jam made of our favorite fruits, particularly with no added sugar !! Thanks Megala – hopefully you’ll give it a go! I just bought two strawberry packs and I think I will try this delicious looking recipe. Thanks for sharing Laura. That’s so good to hear Ana – it keeps really well in the fridge for weeks too! I will try this when berries are in season again. All of the sugar free versions I have tried are dreadful. I make jam every year, with added sugar but much less than commercial brands. Hi Liz – I don’t have a sweet tooth so the absence of sugar is fine with me, but I think a little stevia or honey would do the trick as well….keep me posted.